Brian Gress is the first speaker of the winter quarter. From spotted wing drosophila to spider glue to wild bees! Medical entomologist Geoffrey Attardo, assistant professor, UC Davis Department of Entomology and Nematology, has compiled a great line-up of speakers for the winter quarter. The Wednesday seminars, to begin Jan. 9 and continue through March 13, will take place from from 4:10 to 5 p.m. in 122 Briggs Hall. They are open to all interested person. Some seminars will be recorded for later posting. First up on Jan. 9 is Brian Gress, a postdoctoral fellow in the lab of integrated pest management specialist Frank Zalom, distinguished professor of entomology in the UC Davis Department of Entomology and Nematology and a past president of the 7000-member Entomological Association of America. Gress will discuss the fruit fly, Drosophila suzukii: its host selection and resistance evolution. 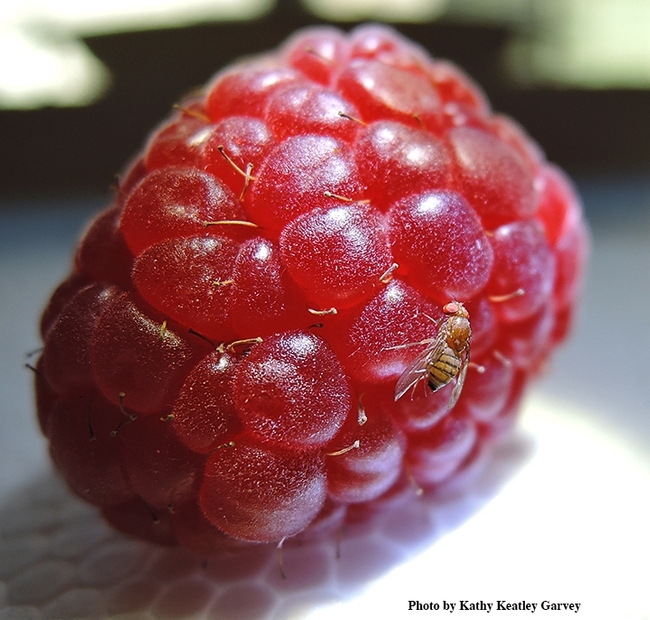 The spotted-wing drosophila, a major agricultural pest, damages fruit in many California counties, according to the UC Statewide Integrated Pest Program (UC IPM). First discovered here in 2008, "it infests ripening cherries throughout the state and ripening raspberry, blackberry, blueberry, and strawberry crops, especially in coastal areas. It also has been observed occasionally attacking other soft-flesh fruit such as plums, plumcots, nectarines, and figs when conditions are right." The adults are about 1/16 to 1/8 inch long with red eyes and a pale brown thorax and abdomen with black stripes on the abdomen, UC IPM says on its website. The males have a black spot toward the top of each wing. The females have not spots. They have "a very prominent, sawlike ovipositor for laying eggs in fruit." Title: "Host Selection and Resistance Evolution in Drosophila suzukii"
Title: "Stochasticity and Spatial Population Dynamics"
Title: "Understanding the Molecular Mechanisms underlying Photoperiodic Time Measurement in Drosophila melanogaster"
Title: "The Role of Hormone Receptors and MicroRNAs in Mosquito Reproduction and Metabolism"
Title: "Evolution of New World Scorpions and Their Venom"
For further information on the seminars, contact Geoffrey Attardo at gmattardo@ucdavis.edu.